In this piece, Emily Wade makes her indignation palpable; it’s almost as if she’s been played for a dupe. In that regard, Emily can be forgiven. The wind industry has worked overtime to overstate its green credentials and bury anything to the contrary. Real eco-warriors, like Emily, aren’t so concerned about the interment of inconvenient facts by wind industry spruikers, they’re furious at the fact that what the wind industry is actually burying tens of millions of tons of toxic waste, among a list of other environmental sins. New studies estimate that wind turbines will produce 43 million tonnes of waste by 2050. Scientists say that wind energy is an unsustainable environmental disaster that fills landfills and harms wildlife. However, the United States Department of Energy boasts that wind energy is the number one source of renewable energy capacity in the U.S with enough capacity to power over 20 million homes. “The Department of Energy’s Wind Energy Technologies Office says that it “leads the nation’s efforts to research and develop innovative technologies, lower the costs, and enable and accelerate the deployment of wind energy throughout the nation. 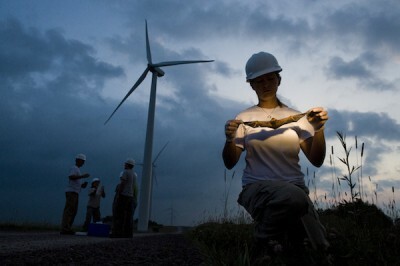 The office has a comprehensive portfolio and invests through cooperative agreements with a variety of businesses, universities, laboratories, and other organizations.” The Department’s Wind Vision Study Scenario seeks to increase the nation’s wind energy supply 35% by year 2050, and it uses incentives like government grants and tax credits to achieve this goal. The government claims that wind power is sustainable, but The Journal of Waste Management’s 2017 publication titled “Wind Turbine Blade Waste in 2050” states that wind turbine blades are filling landfills. In addition to the blades, the study states that there is up to 45% additional waste from manufacturing, testing, and the in-service stages of wind turbine usage. The scientists estimate that there will be 43 million tonnes of worldwide blade waste by 2050. The estimated numbers were based on current data from sales and production, and did not account for the government’s plan to dramatically increase turbine use by 2050. 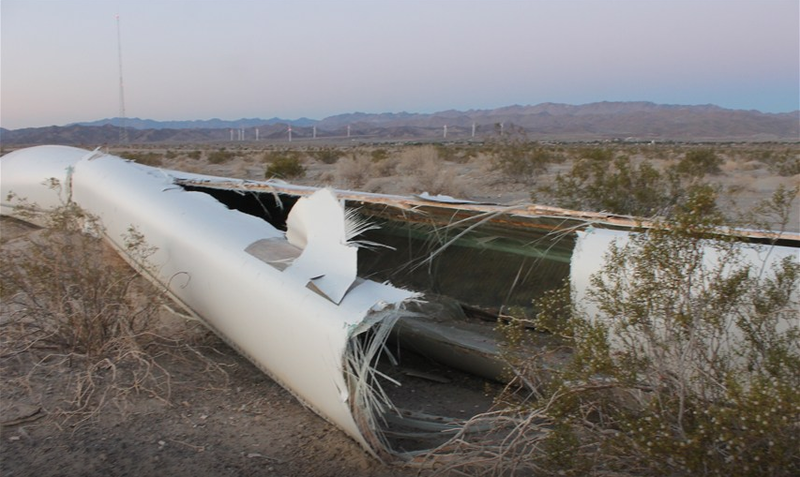 A study from October 2016 titled “Unsustainable Wind Turbine Blade Disposal Practices in the United States” calls for policy interventions to encourage industry to improve wind turbine blade production and disposal. They state that although trashing the blades in landfills is the most cost-effective method of disposal, it has environmental costs that need to be accounted for. Studies also show that wind turbines can be a threat to wild life. The government admits that spinning turbine blades pose a threat to bats, but the most recent study that they show on the topic is from 2013 and has stats which differ from more recent studies. The Wind Energy Technologies Office (A division of the Office of Energy Efficiency & Renewable Energy) claims that bat fatality rates have been reported at levels between 1-30 bats/MW per year. A 2017 study states that wind turbines threaten hoary bat populations to the level of extinction. Scientists estimate that 90% of the the hoary bat population could be lost to turbines in the next 50 years. The scientists state that policy decisions need to include conservation measures that need to be initiated immediately. When compared to oil, coal or nuclear power, wind seemed like a good idea for energy. However, wind turbines are made from non-recyclable parts that are creating tonnes of waste. The American government needs to stop giving incentives with tax dollars for wind technology, but instead, support development of truly clean, alternative energy and freedom in the energy industry. Battered: another inconvenient truth for wind worshippers. True enough, every industry attracts grubs – those who make a mess of things, genetically incapable of operating in any other fashion – and cowboys – those who willingly create environmental havoc, and then spend the rest of their time actively avoiding the consequences of creating it. For the wind industry, however, the problem is that when you start from a self-aggrandising moral platform just south of Heaven, your critics are always primed and ready to have a field day whenever one of your proponents is caught acting like a cowboy or a grub. The first windmills of Jaisalmer came up in 2001. Since then, the desert has become among the largest windfarms in the world. The spread of this “sustainable” energy source, however, has not come without a cost. Local people who have lived off tourism are finding it harder to attract foreign visitors. 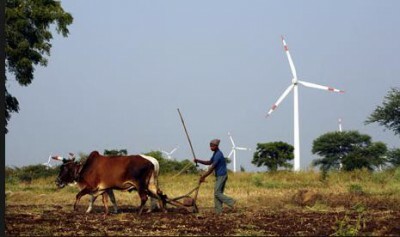 Villagers in Kanoi, near the Desert National Park, complain of the unceasing noise from the windmills. An inspection by a small team that included Devendra Singh Bikundiya of the state pollution control board last month found that plastic was burnt close to the border of the DNP. Air was polluted and toxic cinders were getting into sand dunes. The large equipment used in windfarms comes packed in plastic. Once the equipment is erected, the plastic is piled in desert sand and burnt. Villagers have been petitioning the district administration to act against the firms causing pollution. 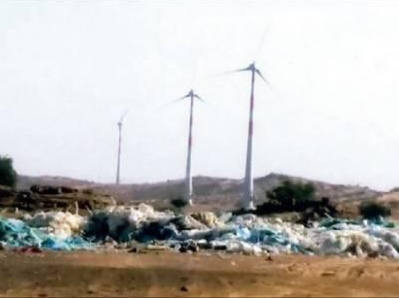 In their petition, villagers name Vish Wind Infrastructure, a Mumbai-based firm, which has been granted lease of land for windfarms close to the border with the Desert National Park. Windmills installed in this area pose a threat to the highly endangered Great Indian Bustard – it is estimated that less than 200 birds of this species now survive in the world. “The Khaba-Kanoi road is the one taken by camel safaris. There was a time when foreign tourists would spend four or five days in these parts, moving with camels, pitching tents and spending nights looking up at starry skies. The lights atop windmills no longer allow an uninterrupted view of starry night skies. Tourists cannot be persuaded to stay more than two days, at the most. What foreign tourists seek is a sense of adventure, of being out where there are not so many people. Here, however, we now have windmills and even piles of plastic waste, slowing burning away. What can we expect to show in the desert these days?” asks Virender Singh, a conservationist who runs a resort close to the border with the Desert National Park. The Jaisalmer culture and heritage conservation group, of which Virender Singh is a member, submitted several petitions to local authorities seeking that action be taken against firms polluting the desert air. “The burning plastic leaves toxic material. The fumes and the ashes are harmful for even reptiles and other creatures that live in the sand. The water in the area is polluted too, and farmers are affected,” says the petition that the group has submitted to district authorities in January this year. Aparna Arora, chairperson of the state pollution control board and Jaisalmer district collector Kailash Chand were both busy in meetings and unable to answer queries. No phone number could be traced for Vish Wind. Wind industry grubs and cowboys are not confined to India. It’s time for a thorough analysis of the industrial wind industry, from production of every component part to the dismantling/ decommissioning and recycling of all materials used. As well, the inefficiencies during their proposed lifetime, including the cost of maintenance and repair must be added in. In addition, the dollar value and ethical cost of harm to humans and animals on whose land the audible and inaudible noise trespasses and does damage, including the legal costs and the financial settlements due when justice for the harm is served, must be included before the sustainability assessment can be made. This needs to happen NOW so that these turbines can be turned off as quickly as possible. At last some true environmentalists and scientists are waking up up to the disaster that is wind energy. We are hearing more and more from these people writing and commenting on the true situation. Surely our Governments will come to accept the truth before it is far too late. For SA it is almost to late and there looks as if there is no hope of our *leaders! * ever climbing down from the nacelles they have climed onto – too many favours still to deliver on. The utter size of these machines is just too large to generate green emotions among critical thinkers. The reaction of a normal person is visceral and rationalizations can’t change it much. Wind zealots have mentally tricked themselves into seeing something far more subtle than reality. It’s like staring so long at white elephants that you see only feet or tusks. Aldo Leopold’s famous land ethic is one of the main things wind power is violating. Psychiatrists should recognize a new mental illness and call it “wind-blindness” or “windenial.” It’s a psychological mystery to environmentalists who thought they understood each other’s motives. So sad we destroy our beautiful earth with these ineffective polluting monstrosities and for no valid reason. The landscape scared by these football field sized blades causing a noise that causes health issue’s. What the hell is Environmentally friendly about any of this? TIME we divert some or ALL of the taxpayer billions poured into useless, symbolic, feel-good energy (wind and solar) into Hydrogen Fusion R&D – genuine “clean, green, efficient, reliable, sustainable” energy. Industrial wind turbines adjacent to farmers using oxen and plough is odious and incompatible. I can only imagine how difficult it must be to control the team with shadow and glint flicker, sound, pressure and any health impacts from working under conditions turbines can impose. There is pollution and waste during production and operation such as oil spills, tarp/s blowing out to sea, and also in wind farms which lie rusting and abandoned for years in deserts, on islands and in backyards. Too much waste in replication of interconnectors, electrical systems, smart meters. The oil and chemicals, diesel backups and batteries and magnets required nationally so these things can attempt to operate do not make for a clean, green or wondrous industry. The loss in housing values, tourism, good health has not been accounted for. People I talk to are horrified by our personal and collective experiences dealing with the injustice of a system geared solely to reach a distant target. City people usually have NO IDEA of the damage wind turbines do to our communities and environments. The images of burning plastic and stinking ponds and spewing fibreglass, birdlife spun out of their innocent flight are undeniable facts, and not by unscrupulousness nor social management may they be disregarded. Because as any responsible, honest human being knows, truth always outs, someone has to answer to the deception and pay the price. If recent studies demonstrate that wind energy is an “environmental disaster” then it could (and should) be argued that wind energy is “unsustainable” and as such, fails to satisfy the basic objectives of the REE Act. Who among us would shed a tear if wind energy was exempted as a Renewable technology and the industry became ineligible to milk the RET cash cow? ?